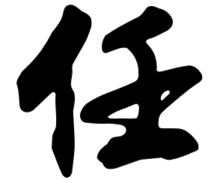 Rén is the Mandarin pinyin romanisation of the Chinese surname written 任 in Chinese character. It is romanised as Jen in Wade–Giles, and Yam or Yum in Cantonese. It is listed 58th in the Song dynasty classic text Hundred Family Surnames. As of 2008, it is the 59th most common surname in China, shared by 4.2 million people. ^ "百家姓" [Hundred Family Surnames] (in Chinese). Guoxue. Retrieved 2014-09-16. ^ 中国最新300大姓排名（2008） [300 most common surnames in China (2008)] (in Chinese). Taiwan.cn. 2009-01-06. Retrieved 2014-09-18. This page lists people with the surname Ren. If an internal link intending to refer to a specific person led you to this page, you may wish to change that link by adding the person's given name(s) to the link. This page was last edited on 17 February 2018, at 15:58 (UTC).